Alexandria Marzano-Lesnevich to the program today. Alexandria has received fellowships from The National Endowment for the Arts, MacDowell, and Yaddo, and a Rona Jaffe Award. Also, she teaches at Grub Street and Harvard’s Kennedy School of Government. 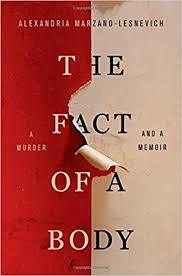 In this episode, we will talk about her book, The Fact of a Body: A Murder and a Memoir.